The results are in and Brainstorm Studio has been named Business of the Year 2016 by the Melville Chamber of Commerce for the media category. The Melville Chamber promotes economic and business development in the Long Island community by offering networking opportunities, resources and programs. 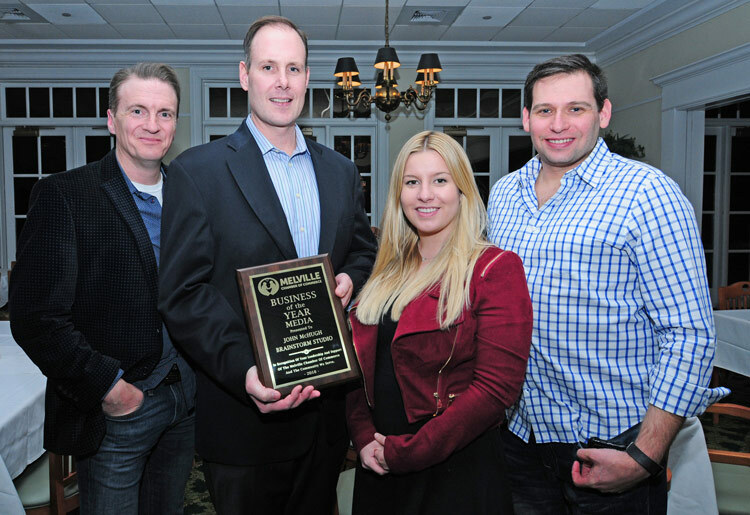 The award was presented to John McHugh, president of Brainstorm at the Annual Chamber Awards Dinner on January 30th. John was among a select group of individuals that were recognized by their dedication to provide exceptional service to businesses across Long Island. Suffolk County respects and values those who have made a valuable contribution on behalf of their community and John and the Brainstorm staff was thrilled to be honored at this ceremony. Brainstorm joined friends and fellow chamber members in commending and congratulating John on this prestigious award presented by DuWayne Gregory, Suffolk County Legislature's Presiding Officer. "2016 was a great year for Brainstorm and this award validates all of the hard work my team and I have done this year," said John McHugh, President of Brainstorm Studio. "We're looking forward to remaining active in the chamber and the Long Island business community." Our thanks go out to all of the winners in this years' competition.